Agriculture plays a large role in the economics of Mason County. The area is rich in farmland...with more than 1,000 farms covering over 200,000 acres. Main crops include sweet corn, asparagus, apples, strawberries and blueberries, with numerous dairy farms that produce milk and cheese. The newly-formed Agricultural Trail is comprised of 17 stops within Mason and Oceana counties that include farms, farmers markets and a winery. Most are open to the public for shopping and/or tours, but some stops are seasonal. The Agricultural Trail is part of a series of self-guided tours with audio-visual narration through your smartphone. (301) House of Flavors, 402 W. Ludington Ave.
(316) Country Dairy, 3476 S. 80th Ave., New Era. You may download a brochure of the Agricultural Trail with locations and interesting details about each stop along the way. 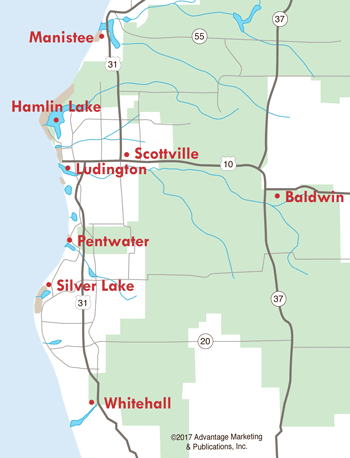 Or, you can pick up a brochure at the Ludington Area Convention & Visitors Bureau in the downtown location or at 5300 U.S. 10.